I know I’m a bit late to the New Year-themed posts, but I spent the last week thinking and working on my plan for the new year. But first, I’d like to talk about 2015. First, I learned about a lot of stuff. I read 54 books, which is a little more than one book a week. In 2013 and 2014, I read around 40 books each, so I’m proud of finally hitting this book-per-week accomplishment. Audiobooks from the library and a 20 minute commute to the day job helped. Ebooks on my tablet to read during lunch and other periods of downtime also helped. Most of the ebooks were obtained through Project Gutenburg, Pragmatic Programmers, and the Humble Book Bundle. And I also enjoyed reading a huge stack of Terry Pratchett books that a friend lent me shortly before Pratchett’s death. Only six books were directly related to either game development or personal development. The rest were fairly evenly split between fiction and non-fiction. That isn’t to say that I didn’t learn much. I learned about the Prohibition era, the Wright brothers, and Charles Lindbergh’s historic flight over the Atlantic. I learned about the history of chess, and I learned about Phil Jackson and Michael Jordan’s leadership on the Bulls. I learned about prostitution in Chicago’s Everleigh Club, and I learned about how humanity’s understanding of information as a concept has changed over the centuries. I allowed myself to get fascinated with biographies and histories, and I think the exposure to all of these ideas and knowledge can only help my creativity. Another thing that went well in 2015 was that I remembered my goals. In the past, I would make goals for the beginning of the year, and then I would find myself at the end of the year remembering that I had set goals almost a year prior. I would lose sight of the big picture because I was focused on the actual details of work for a long period of time, or I would just forget that I had a goal and so not remember to make plans to achieve it. Some people hate New Year’s resolutions because they never keep them, and I would feel this frustration with my goals. If I got sick, it would sometimes set me back so much that I had a hard time getting back into whatever daily habit I had established. It was too easy to get knocked off of my routine and keep me off. Last year, however, I think I did a very good job of keeping my goals in front of me. I may not have actually MET my goals, but throughout the year I was making progress on them or at least being fully aware when I CHOSE not to give them a priority. 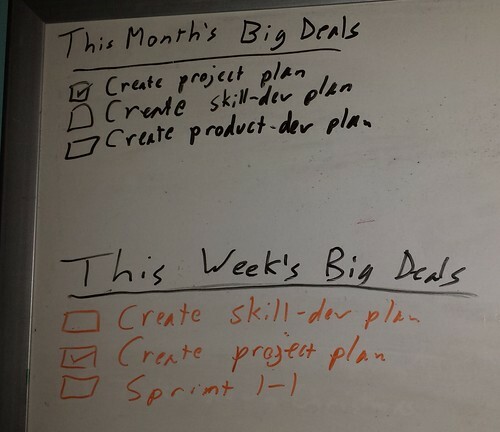 I made highly visible reminders for my quarterly game development and writing quotas I was trying to meet, my monthly “big deals” I wanted to accomplish, and my weekly outcomes. At any given time, I knew what I was supposed to be focusing on. As an example of one result, I put in a lot more game development hours than I have in the past. Considering that many business owners say that focus is one of their greatest challenges, I’d say that 2015 was a win in this area. What Went Wrong in 2015? Last year was the first year my business made no income. It’s not hard to see why. The main reason was because I didn’t publish a game. An entire year went by without me creating and publishing a commercial game, and a commercial game should be my primary way of trying to earn income for my business. Now, I worked on a project during this time. I had some false starts with it, though, and I changed direction, and it took me awhile to get the design down to something manageable. I did paper and digital prototypes, and I did some infrastructure/technical work as well. What’s frustrating is that I made an effort to put in more time towards game development. I have a day job and a family, and so taking advantage of my limited “spare” time to make progress on my game project required discipline and effort. And quite frankly, THAT part worked out fairly well. As I mentioned above, I set quotas for myself, and I managed to spend more hours on game development in 2015 than on game development and writing combined in either 2013 or 2014. So, good job, Self. The problem is that I didn’t have a specific plan. I had tried to make a plan, but it was little more than a list of tasks that weren’t necessarily well thought out. This kind of a minimalist plan might be more than enough for some game developers, but since I didn’t set deadlines or milestones for myself, it was easy for me to take a task and work on it for way longer than I needed to. That game menu could be generalized and data-driven, right? I could write my own “simple” physics engine, right? I tried not to worry about estimates or deadlines, and instead I focused on just making progress every day. The thinking was that eventually I would finish. The thinking turns out to have a flaw. Basically, I was focused primarily on effort, and it didn’t get me anywhere very quickly. In the past, I made some money through Google AdSense and Amazon affiliate links. Not much, but more than enough to pay for my web hosting. These days, my blog isn’t as popular as it once was, and ad revenue has almost completely dried up. I used to make an order of magnitude more per month, and I could expect to get a check from Google every six months or so. Now, it’s been a couple of years since they last paid me because I haven’t hit their minimum threshold yet. And according to my projections, they won’t pay me this year, either. In 2015, I set a goal of publishing at least one game by December 31st. I fully expected to publish one much earlier, but I gave myself that long deadline as a very generous cushion. Every month, I would find myself realizing that I was getting closer to that deadline without much to show for it. Then it was December, and then it was 2016. Oof. So, that generous cushion was stupid. I never felt any urgency. At dsmAgile in September, I saw Geoff Wilson give a presentation called “Barely Manage to Lead”. He talked about a game project that failed after working for a year and a half before getting user feedback. Today, one of his keys to success is to create and deliver a Minimum Viable Product in 90 days or less. I found that even though I actually had about 90 days after his talk to focus on creating this MVP, I still didn’t accomplish it. The lack of a solid plan was my real failing. I erred on the side of too little formality. After all, it was just me in my business. It’s not like I needed to do any kind of formal reporting to a stakeholder about progress or release projections. But remember, last year showed me that keeping my goals in front of me helped me remember to keep working on them. I realized what I needed to do was focus on impactful results instead of effort. Since a more laid-back kind of project plan (or the lack of one) didn’t help, I’m going to swing the pendulum the other way and do more formal planning. I spent almost nine hours over the last week creating a project backlog, identifying all of the features and goals I have for my project. I created a project roadmap for the first time in my life, which helped me identify roughly what I’ll be working on and when. I created an initial release plan based on my rough estimates, breaking down what I’ll be working on each week for the next three months. And I have my first week’s tasks based on the items in my backlog that I will be working on. I’ve never had such a plan in place for myself. The closest I came was when I was working on Stop That Hero! and had created a backlog with items allocated to sprints, but I allowed myself to slip self-imposed deadlines too often instead of doing the needed reprioritizing and replanning. I felt like I needed to do real work instead, and I never realized how much creating a prioritized plan IS real work. This project plan, however, fills me with confidence that I will have something to show for my efforts in a few months. For the investment of a few hours, I’m sure I’ll save plenty of time and will be able to hit my goal. I also want to direct my learning a lot more, and so I will create a skill-development plan. I want to repeat my book-a-week accomplishment this year, but I want to be more conscious and deliberate about what I read in service of my skill-development goals. For example, if I want to improve my cooking skills, I’ll seek out multiple culinary books and audiobooks and read them all in a row. My outcome focus also means I’m open to other ways to accomplish this learning besides reading. As another example, one of my goals is to learn more about Machine Learning, and aside from reading about it, I know I can watch Caltech’s Machine Learning lectures that a colleague told me about. So, bottom-line: 2016 will be different because my focus will be on outcomes as opposed to effort and putting in hours. Those things will still be needed, especially as I’m a part-time indie game developer with a day job and family, but those efforts will be aimed at targets rather than be seen as good for their own sake. I will take what I did well in 2015 and harness it way better. I’m excited about 2016, and I can’t wait to tell you how I succeeded.